Owned and operated by Bill Mannion, JP&R is the preeminent legal public notice agency in New York. Owned and operated by Bill Mannion, JP&R is the preeminent legal public notice agency in New York. No other firm surpasses the knowledge and experience of our team of experts. Fluent in every aspect of legal notices, JP&R is the only agency to rely on for all your legal publication needs. A dedicated team of New Yorkers Serving the greatest city in the world. We skillfully complete our client’s orders accurately and swiftly while maintaining great interpersonal relationships one can only establish with a boutique agency. Bill has been involved in the New York legal advertising arena since 1978, his experience and professionalism over this period of time has made him an invaluable asset to the attorneys and firms who constantly seek his guidance. Always accessible to his clients, Bill's level of willingness to answer questions and offer suggestions is yet to be surpassed by any other principal in the industry. He is also a NYC Department of Consumer Affairs Licensed Auctioneer who conducts UCC and Lien Auction Sales throughout the tri-state region. Bill has appeared as an expert witness testifying in federal, state and city courts regarding legal notices and auctioneering. Bill is an avid theatre buff, Yankee’s fan, and loves to go on RV trips with his wife. Matthew has been with JP&R Advertising since April 2017. He oversees all day-to-day operations, future business planning, and is also a NYC Department of Consumer Affairs Licensed Auctioneer who conducts UCC and Lien Auction Sales throughout the tri-state region. Previously to joining JP&R, Matthew received his B.A. from Norwich University (’12) and subsequently served in the United States Marine Corps as an infantry officer from 2012 – 2017, achieving the rank of Captain before ending his active duty career. Matthew is a fanatical NY Giants fan, he likes to snowboard, travel, and play the piano. A member of JP&R since 1998, Tricia manages every facet of our foreclosure department operation. She arranges sale dates with Referees, organizes notices for publication, ensures legal postings are being completed, and takes care of receiving and sending affidavits of publication. In addition to accomplishing these concrete tasks, Tricia also spends a lot of her time advising clients on how to proceed with publication in a timely and efficient manner. She maintains our statewide network of clerical services and attorneys who attend mortgage foreclosure sales on behalf of the plaintiff's counsel. A member of JP&R since 2000, Twanda has done it all. She has worked in every department since joining JP&R; however, recently she has settled into her current position as the resident Real Property Summons publication specialist. Prior to establishing her Summons niche, Twanda published the following: LLC Notices of Formation, Liquor License Application Notices, Mortgage Foreclosure Notices of Sale, Co-Operative Apartment Notices of Sale, etc. She is also in charge of accounts payable, making sure the proper payments to our vendors are taken care of in a timely manner. Fernanda has been with JP&R since 2013. She has since overseen the successful publication of more than one thousand Limited Liability Corporation (LLC) notices. In addition to LLC publications, Fernanda is our utility player and arranges for the following types of publications: Sheriff Sales, Foundation Notices, Probate Citations, Liquor Licenses, Sidewalk Cafés, Taxi Medallions, Order to Show Cause, Common Trust Fund Notices, Insurance Liquidations, and many more. 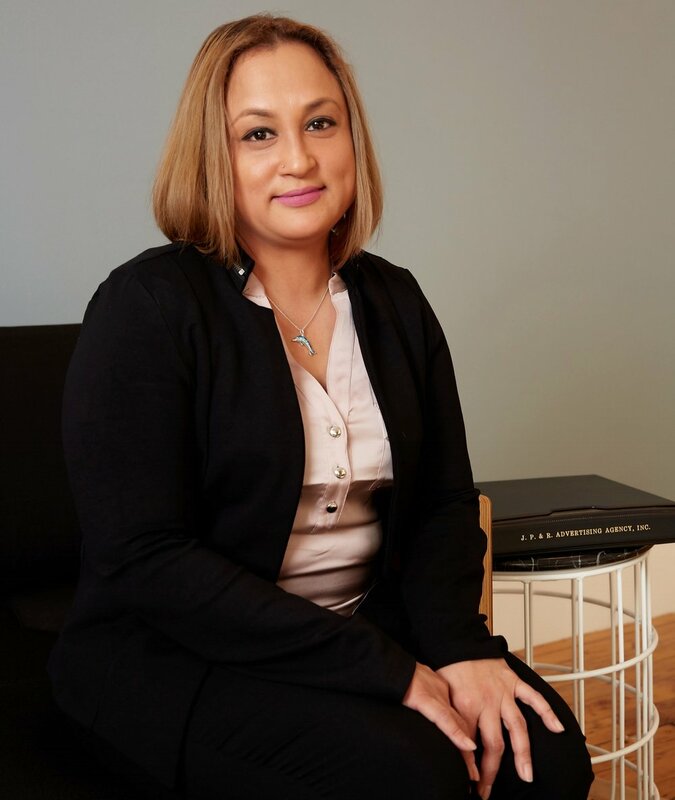 Fernanda does not just simply arrange for publications for these matters, but is well versed in the nuts-to-bolts procedures for each of these and can advise anyone as to best practices for success. Melvin joined the JP&R team in 2015. He ensures timely reporting of canceled sales and the results of successful sales are reaching the proper audience. We want to keep our clients, vendors, and Referees as informed as possible and Melvin plays an intregal role in that mission. He also aids in the creation of Notices of Sale that are to be published. Prior to joining JP&R, Melvin spent ten years with the Marriott Hotel as a Front Office Manager and night auditor. "JP&R has been providing unparalleled service for over a decade for all of our firm's advertising needs. Attention to detail and professionalism can be expected when dealing with Bill and his staff." Kelvin is JP&R Advertising’s newest addition to the team. Since joining us in Spring 2018, Kelvin immediately became an integral part of JP&R’s work flow and company rhythm. Serving primarily as an administrative assistant to Fernanda Moina, Kelvin spends most of his time at JP&R proof reading publications, performing accounts receivable duties, forming and publishing LLC’s, and publishing liquor licenses. In addition to these tasks, Kelvin is also in charge of managing the bulk mailing project we complete on a weekly basis. An aspiring entrepreneur in his own right, Kelvin has, on multiple occasions, aided JP&R in identifying unnecessary expenses and injecting new ideas to grow the business. Kelvin received his Bachelor Degree in Business Administration from Baruch College (‘16) and is currently pursuing his Masters Degree in Business Administration from Brooklyn College (‘21).